We are anticipating one of the most impressive runs of chinook and coho salmon this season and there will be some fishing action that can’t be missed! State fisheries managers for the Columbia river watershed have unveiled some promising forecasts for the 2014 season, describing potential run size for a combined 3 million coho and chinook salmon returning this fall. 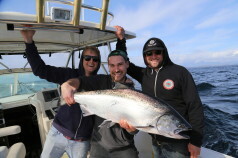 This is fantastic news for the Tofino fishing charter fleet and local recreational anglers alike, not too mention our valued returning customers as we’ll be in for some even more consistent summer fishing than we’ve seen over the last few seasons. Typical timing for these larger chinook runs are earlier in the spring and summer, so expect to see good numbers in May, June and early July, where as the timing for coho salmon will be from mid-July through October. With a combined forecast of 1.6 million for chinook and 1.2 million for coho, Tofino anglers will be kept busy most of the season. The waters offshore of Tofino, B.C. offer some great flexibility in terms of timing and abundance of Pacific salmon. Instead of relying on any one or two local river terminal fisheries, we have the opportunity to intercept a variety of runs returning not only to Vancouver Island, but to intercept runs traveling to the Fraser River, Puget Sound and as far as the Columbia river drainage in Washington and Oregon States. With such variety in timing and abundance, we may enjoy one of the longest salmon fishing seasons on the B.C. coast, allowing salmon fishing opportunities year round in Tofino. That being said, timing in our peak season, brings larger runs and more variety in salmon species including all 5 eastern Pacific salmon, namely Chinook, Coho, Sockeye, Pink and Chum salmon.